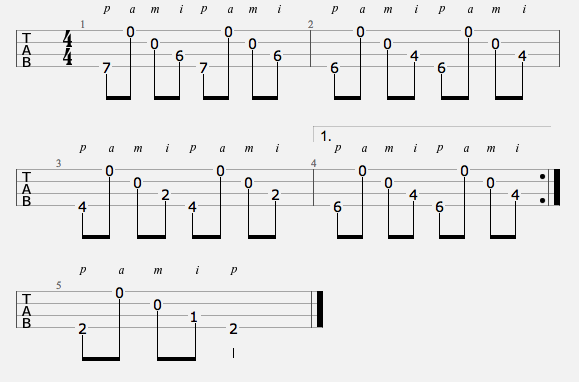 Following on with this week’s fingerpicking accompaniment theme with some popular ukulele picking patterns. 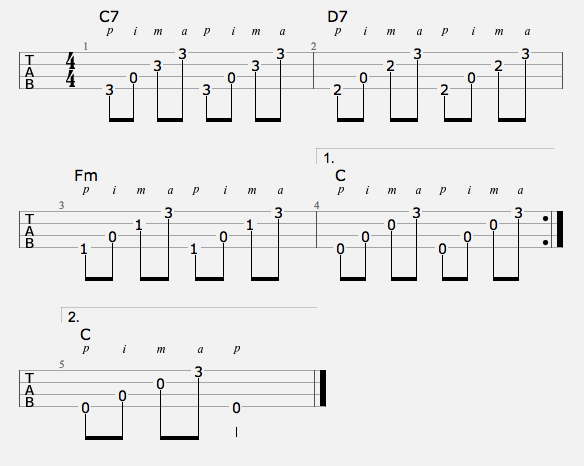 This post follows on from those and the Fingerpicking Ukulele – First steps post with patterns using those picking methods. A simple pattern using each finger in order with the thumb starting on the g-string then moving to the C-string. Making a p i m p i m p i m… picking pattern. 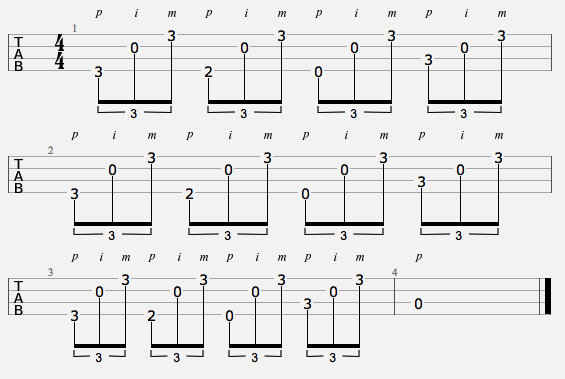 Since you’re using three fingers, this pattern is well suited to playing in triplets. A similar pattern to last time. 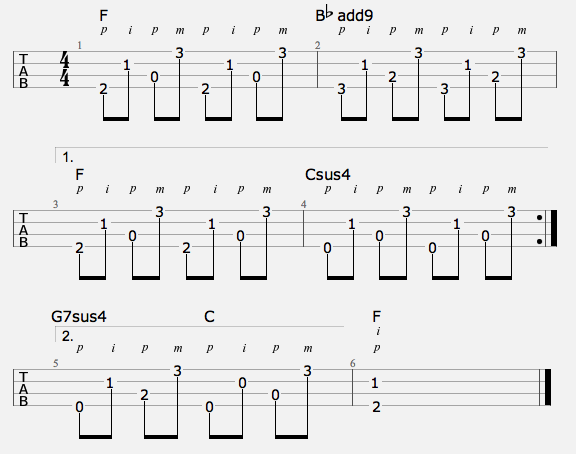 But here you’re not using triplets so you have to fill out the bar with just the first two notes of the pattern. So you play p i m but just p i the final time. Rather than going up the strings as you did in the last two patterns here you pluck with the thumb then go down the strings. So it’s p m i repeated. Alternating is my favourite way to use the thumb and two fingers method. Here the thumb alternates between the g- and C-strings. In this particular pattern you pluck g-string with your thumb, E with middle, C-string with thumb, A with middle. So it’s p i p m.
Picking with your thumb and going up the strings to make p a m i. Here you pluck the g-string with your thumb. Then go through the strings in the opposite direction. Making a p a m i pattern. If you’re unsure of which method of picking to use for a pattern I have a general rule for choosing. If the g- and C-strings are played next to each other at any point I go with the one finger per string method. It’s much easier than having to switch strings with your thumb quickly. But if the g- and C-strings aren’t played consecutively then I’ll go with the thumb and two fingers method. I find it much easier to play in general. Here’s a quick illustration. This is the first thumb and two fingers method played using the one finger person string method. If you’re anything like me you’ll find it trickier to play this way.